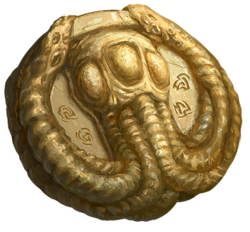 Monster coins enable players to play as monsters within the event system. This ranges from playing friends as a horde of zombies, to becoming a massive dragon. Sometimes the disturbed beings could take the form of packs of dire wolves, hordes of zombies roused from their graveyard, or even, rarely, an epic-tier dragon flying out of a volcano once a node reaches its maximum level. In any case, the disturbed monsters have to tackle a series of destructive objectives, which can either be handled by the the AI or, more interestingly, by a player. The player in turn would attempt to complete all those actions much as in a multi-objective quest, hopefully before other players brought him or her down. Monster coin events are system spawned events. They are structured in a way to prevent groups from gaming the system. Monster coin events are triggered by activity in the world, such as node advancement, defeating a boss or constructing certain types of buildings within a node. Server messages appear for players in the vicinity of these dynamic events. Drop tables are disabled for player controlled monsters. Monster coins are only usable during monster coin events. Events do not occur before sieges. Events do not occur during sieges. Two different monster coins can not be used on the same monster player during the same event. Some events have monsters that can be taken over by multiple players. If no players participate in a monster event, the monsters will be run by AI. Citizens of a Node are not eligible to control monsters attacking that node. Purchasable from the cosmetic store. Monster coins are not tradeable. Monster coin events (Bosses) cannot destroy or delevel nodes. They can disable certain buildings, services and NPCs within a node. Monster coin events do not occur before sieges. Monster coin events do not occur during sieges. Node sieges are the chief mechanic for destroying or deleveling nodes. Cosmetics are the only rewards available to players from monster coin events. Cosmetic rewards resemble the creature that was being controlled. Epic monster coin events are of truly fitting proportions. These events occur randomly in the world as well as in realms where nodes have advanced to the City and Metropolis stages of development. This would be a legendary boss awoken from their long and deep slumber: A mighty dragon perhaps, whose sole purpose is to plunder to punish those who have summoned his malice and hate. ↑ Video, 25 May 2017 (0:02). ↑ IGN: Ashes of Creation first look: An MMO that lets you be the boss. ↑ Livestream, 26 May 2017 (22:19). ↑ 6.0 6.1 6.2 6.3 6.4 6.5 6.6 6.7 Livestream, 3 May 2017 (36:25). ↑ Livestream, 26 May 2017 (22:14). ↑ 17.0 17.1 17.2 17.3 Livestream, 1 September 2018 (54:06). ↑ 19.0 19.1 19.2 19.3 19.4 19.5 19.6 19.7 Interview, 8 August 2018 (4:00). ↑ 20.0 20.1 20.2 20.3 20.4 Livestream, 4 May 2018 (48:14). ↑ 21.0 21.1 21.2 Interview, 17 August 2018 (24:48). ↑ 22.0 22.1 Livestream, 24 May 2017 (22:30). This page's content was last modified on 29 November 2018, at 03:30.